(U//FOUO) Possession of large amounts of weapons, ammunition, explosives, accelerants, or explosive precursor chemicals could indicate pre-operational terrorist attack planning or criminal activity. For example, in preparation for conducting the July 2011 attacks in Norway, Anders Behring Breivik stockpiled approximately 12,000 pounds of precursors, weapons, and armor and hid them underground in remote, wooded locations. 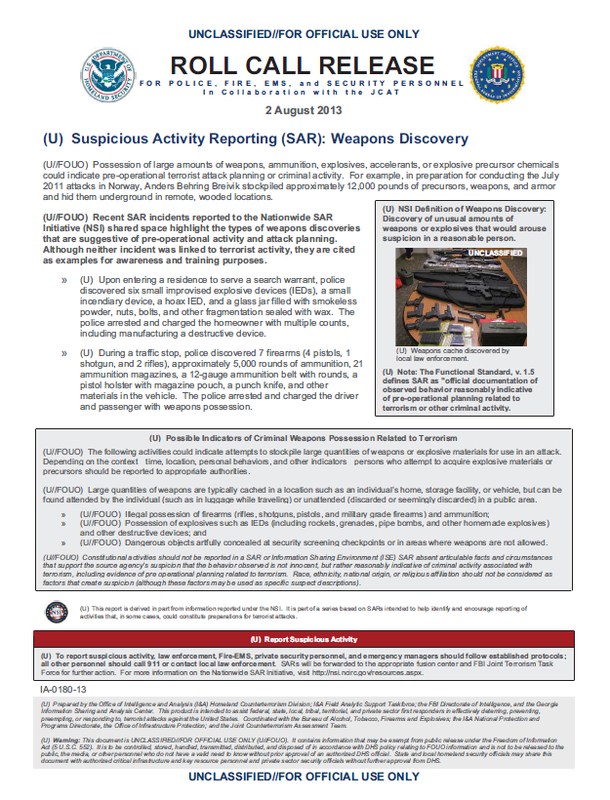 (U//FOUO) Recent SAR incidents reported to the Nationwide SAR Initiative (NSI) shared space highlight the types of weapons discoveries that are suggestive of pre-operational activity and attack planning. Although neither incident was linked to terrorist activity, they are cited as examples for awareness and training purposes. » (U) Upon entering a residence to serve a search warrant, police discovered six small improvised explosive devices (IEDs), a small incendiary device, a hoax IED, and a glass jar filled with smokeless powder, nuts, bolts, and other fragmentation sealed with wax. The police arrested and charged the homeowner with multiple counts, including manufacturing a destructive device. » (U) During a traffic stop, police discovered 7 firearms (4 pistols, 1 shotgun, and 2 rifles), approximately 5,000 rounds of ammunition, 21 ammunition magazines, a 12-gauge ammunition belt with rounds, a pistol holster with magazine pouch, a punch knife, and other materials in the vehicle. The police arrested and charged the driver and passenger with weapons possession. (U//FOUO) The following activities could indicate attempts to stockpile large quantities of weapons or explosive materials for use in an attack. Depending on the context time, location, personal behaviors, and other indicators persons who attempt to acquire explosive materials or precursors should be reported to appropriate authorities. (U//FOUO) Large quantities of weapons are typically cached in a location such as an individual’s home, storage facility, or vehicle, but can be found attended by the individual (such as in luggage while traveling) or unattended (discarded or seemingly discarded) in a public area. » (U//FOUO) Illegal possession of firearms (rifles, shotguns, pistols, and military grade firearms) and ammunition. » (U//FOUO) Dangerous objects artfully concealed at security screening checkpoints or in areas where weapons are not allowed. (U//FOUO) Constitutional activities should not be reported in a SAR or Information Sharing Environment (ISE) SAR absent articulable facts and circumstances that support the source agency’s suspicion that the behavior observed is not innocent, but rather reasonably indicative of criminal activity associated with terrorism, including evidence of pre operational planning related to terrorism. Race, ethnicity, national origin, or religious affiliation should not be considered as factors that create suspicion (although these factors may be used as specific suspect descriptions).